Well, I know what I’m getting my nephew for Christmas. 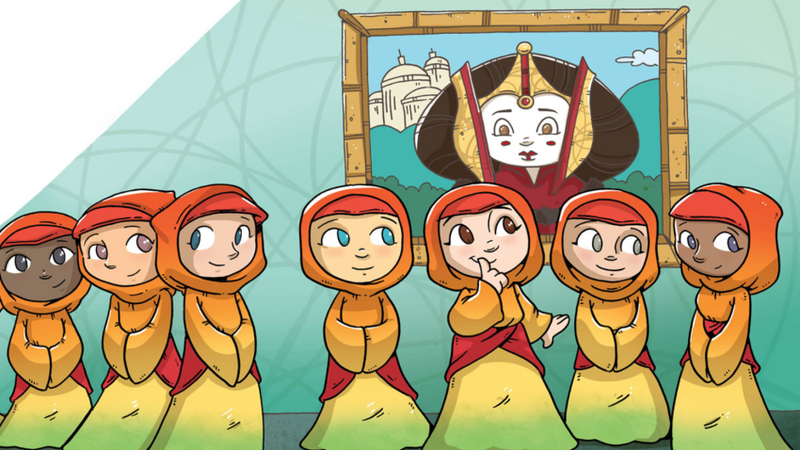 Artist Katie Cook chatted with StarWars.com about the upcoming children’s numbers guide, OBI-123, sharing some of its adorable poems and pages. The book is a follow-up to ABC-3PO, and it uses some of our favorite Star Wars characters from the original series, the prequels, and The Force Awakens to teach small kids basic counting. Sadly, Cook said there aren’t too many Rogue One characters in OBI-123, which makes sense considering all of them died horribly. “I don’t think we’ll see many kids books based off Rogue One characters. Ha. Although now I wish there was a pouty Krennic in a book someday, whining that the Death Star is his project and Tarkin is a meany,” Book said. But still, this looks awesome. Like seriously, why didn’t they have this book when I was a kid? I would’ve much rather learned how to count using Padme’s handmaidens and rathtars than those stupid gargoyles from Hunchback of Notre Dame. There were three, and all of them were terrible. OBI-123 comes out February 14.